This time a nice Moeris watch. Moeris is a respectable Swiss brand from around the turn of the 19th century. Tissot bought and absorbed them around 1970. 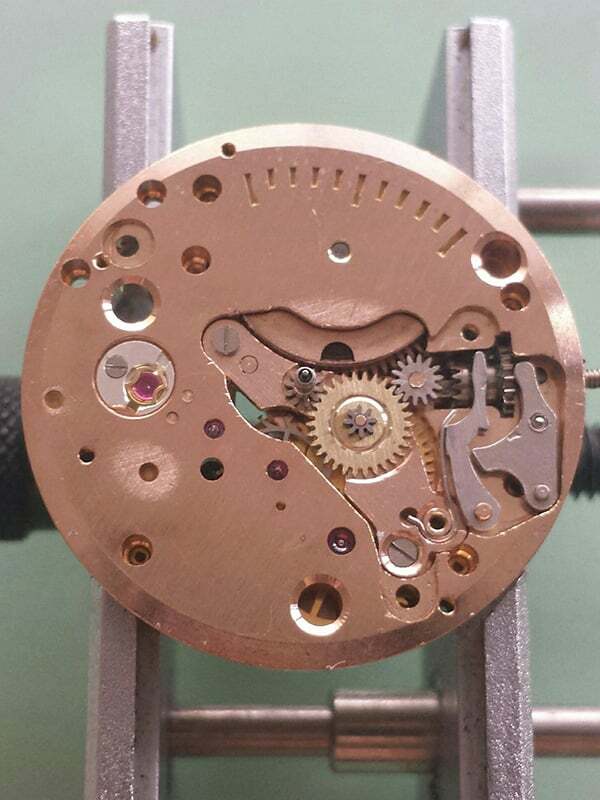 The movement is an in-house Moeris 10 1/2 D. A hand winding movement with 17 jewels. This particular one has an Incabloc anti-shock system. I’d date this watch to be from the 50s. The watch didn’t run at all. Most of the times that’s a bad omen. It shows that there likely is some serious damage somewhere in the gear train or the escapement. The most common causes are a tangled hairspring or a broken balance staff. Anyway… on with disassembling. Remember to remove any power from the mainspring first. This is to prevent damage when you’re working on the wheel train. Remove the balance and the pallets. Normally, this would cause the gear train to turn if there’s any residual power in the mainspring. Gently wiggle all wheels with a peg wood to see if the gear train is stuck. When I do this to the 4th wheel, everything comes alive. It seems something was blocking the 4th wheel and now the gear train is free and operational again. Sometimes, Lady Luck is on your side. Balance and pallets removed. Also, please notice the click spring is a proper spring. One of the case screws is broken. Lift the crown wheel and the ratchet wheel. Remove the broken case screw and lift the barrel bridge as well. The ratchet wheel, crown wheel, and barrel bridge removed. After that, lift the train wheel bridge, the gear train, and the main barrel. What’s left is a driving wheel and a little bridge to hold the post for the cannon pinion in place. This intermediate wheel is necessary to bridge the distance between the main barrel and the 3rd wheel. Usually, the main barrel drives the 3rd wheel. The driving wheel that drives the 3rd wheel is clearly visible. Disassemble the dial side of the movement (motion works and keyless works). Remember to remove that intermediate wheel and its bridge. I pre-clean everything with a peg wood and put it in the watch cleaning machine. Start with the intermediate driving wheel and the cannon pinion post. The cannon pinion post and driving wheel back where they belong. Install the main barrel and place the wheels of the gear train in their correct positions. Fit back the barrel bridge and guide the wheel pinions into the bearing jewels if they didn’t fell into place immediately. You can do so by keeping light pressure on the bridge with a peg wood and wiggle the wheels with another peg wood or (clean) old oiler. Reassemble the wheel train bridge and screw both bridges down. Constantly check that the wheels still spin freely. After that, reinstall the crown wheel and the ratchet wheel with the click spring. Gear train and the two bridges with the ratchet wheel and crown wheel reinstalled. Flip the movement around to install the keyless works and the motion works. The dial side just before replacing the set lever spring. Flip it back around and fit the pallet fork and the balance. The movement runs with an amplitude of 280 degrees, a rate of +5 sec and a beat error of 0.4 m/s. Not bad at all for the “old” mainspring. 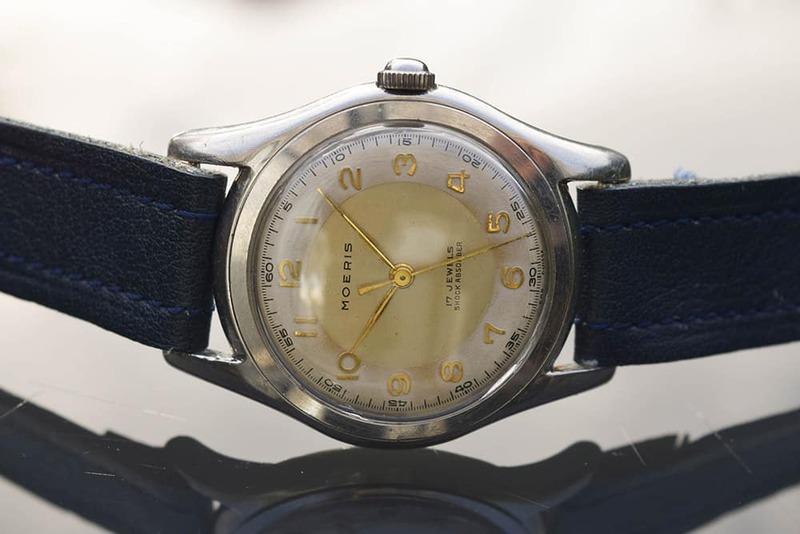 This Moeris watch is ready to be worn for at least another decade. 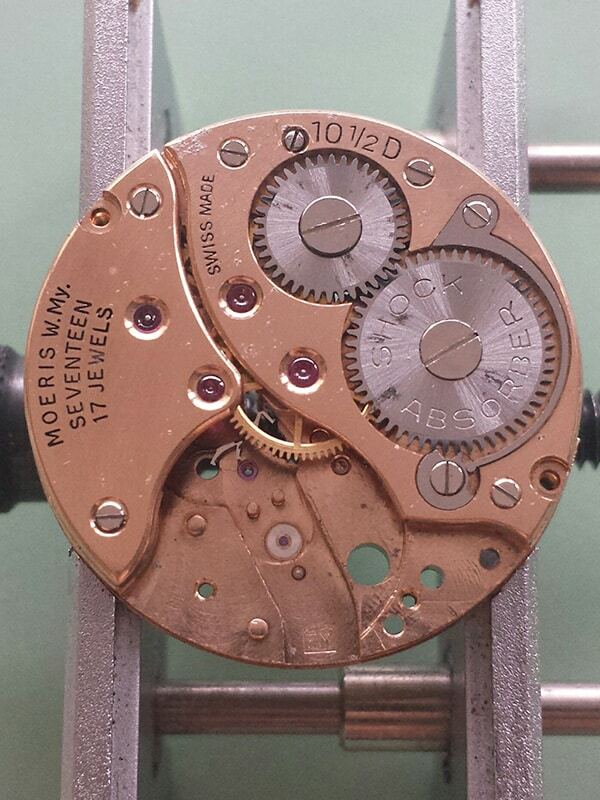 Moeris watch after the overhaul. Looks fresh and keeps good time! Do you have a Moeris in your collection? Let me know in the comments below. I do have a Moeris watch. Nice. Wear it in good health. My everyday wearing watch is a Moeris Exellence, had it serviced one year ago and must say it is the most accurate mechanical watch I ever owned; it goes +1 minute fast in a month. That sounds good! Plus 1 second per day is nothing to be ashamed of.